With opening ceremonies just 17 days away, excitement for the 2014 Olympic Winter Games is building. With that in mind, what better way to keep the excitement rolling than to look back at some great moments in American international hockey history? I looked back at past Olympics and other international events throughout USA Hockey’s history and picked 17 goals that were among the most memorable or carry some sort of significance. Since the 1960 Olympic Winter Games was the first televised Olympics, that’s essentially where everything starts. Some of these goals are way more significant than others, but each played a role in an important moment in USA Hockey history. Though there are numbers attached to each goal in a countdown format, don’t take the rankings too seriously. I just wanted to detail some of the memorable moments throughout history and didn’t put much stock into saying which was more important than others. They’re all important in some way. Every part of USA Hockey’s national team program is geared towards building up to the Olympics or Paralympics, so it only seems fitting to include goals from all international competitions. Not everything could make the cut (because not everything is on YouTube or happened in the television era), but here’s a look at 17 memorable goals in USA Hockey history. The U.S. has really struggled at the Men’s World Championship in recent years and hasn’t won gold at the event since 1933. That said, it remains an important training ground for the depth players in the U.S. system for future events like the Olympics. Even though it’s not a best-on-best tournament, USA Hockey has hoped to build winning teams for this tournament. In 2013, the U.S. had a roster devoid of top-end talent, but brought a lot of younger players including late addition Alex Galchenyuk. The U.S. played Finland to a tie in regulation during the bronze medal game and a scoreless overtime led to a shootout. Alex Galchenyuk had to score to keep the U.S. alive for the bronze medal. After John Gibson made saves on Finland’s next two attempts, Galchenyuk was given the chance to end it and did, helping Team USA win their first medal at the World Championship since 2004. It might not be significant compared to many of these other goals, but it was an encouraging moment concerning where this country’s depth is going in hockey right now. There’s not any good video available of Johnson’s goal, but the story attached to it is just too good not to include. In the 1960 Olympics, the U.S. had to play Canada in the medal round (more details in another goal capsule). In the second period, with the U.S. already up 1-0, dynamic forward Paul Johnson found himself on a breakaway from the red line in. As Johnson approached the blue line, he stunned his teammates by winding up for a slap shot. The puck soared over the goaltender’s shoulder and into the upper corner of the net. Teammate Weldy Olson says he asked Johnson why he let the shot go so early even though he had a clear breakaway. “I had him beat,” Johnson replied, according to Olson who shared the story with the filmmakers for the terrific documentary Forgotten Miracle. The goal stood as the game-winner as goalie Jack McCartan shut the door for a 2-1 win. Olson says he considered the Canadians Team USA’s biggest opponent in the medal round, so Johnson’s long shot proved to be rather important in the grand scheme of things. Unfortunately there’s no available video of this moment, but Angela Ruggiero and Krissy Wendell scored in a shootout to give the U.S. a 1-0 victory over Canada at the 2005 IIHF Women’s World Championship. Though the U.S. women won gold at the Olympics in 1998, the 2005 win was the first gold medal for the American women at the Worlds, halting an eight-tournament streak by Canada. That was the beginning of the U.S. Women’s national team program getting on a more equal footing with Canada. The American women have won five of the last seven women’s world titles, most recently in 2013. Now they have to see if they can win the first Olympic gold since 1998. Phil Housley was part of Team USA’s extremely mobile and productive defensive corps at the 2002 Winter Olympics. His goal in the first period was enough for the U.S. to hang on to beat Russia 3-0 in the semifinals. It guaranteed the U.S. would win its first Olympic medal since 1980, though the Americans would fall to Canada in the gold-medal game. The U.S. had tied Russia earlier in the tournament, but got the country excited about international hockey again with a huge semifinal victory. This video is of the entire game, with Russian commentary. For Housley’s goal, skip ahead to the 1:07:40 mark. The U.S. Paralympic Sled Hockey Team had never won a medal of any color at the Paralympics heading into the 2002 Paralympic Winter Games in Salt Lake City, Utah. With the benefit of home ice and a team full of highly skilled players, the U.S. met defending gold-medalist Norway in the gold-medal game. After closing out regulation with a 2-2 tie. The game had to be decided by a shootout. Norway’s first two shooters scored and Team USA’s second two scored as well. A save by Manny Guerra on Norway’s third attempt gave Kip St. Germaine a chance to put the U.S. ahead. He converted and whipped the crowd of more than 8,317 spectators into a frenzy. Guerra stopped the next two Norwegian shooters and gave the U.S. the gold medal on home ice. Here is the complete shootout. St. Germaine’s goal comes at the 3:30 mark. Preliminary-round games don’t often make headlines, but when the U.S. beat Canada 5-3 in the 2010 prelims it was big news. The Americans beat Canada in the Olympics for the first time since 1960 and this time it was on Canadian soil. It made the U.S. team a must-see attraction for Olympic TV viewers and signified American hockey was definitely alive and well. In the closing minutes of the game, the U.S. was doing everything it could to hold off an onslaught from the very talented and desperate Canadian club. As time ticked down and Martin Brodeur pulled for an extra attacker, Zach Parise sent the puck softly down the ice, enough to get it out of harm’s way, but not enough for an icing. Ryan Kesler stormed down the ice as Corey Perry chased the loose puck for Canada. Despite Perry having a step or two on Kesler, the American forward charged on. As Perry went to collect the puck, Kesler gave one last diving attempt to keep it away from Perry. Inadvertently or on purpose, you be the judge, Kesler knocked the puck into the gaping net sweeping at it while in a superman pose. It also made for some pretty great photos. The win gave the U.S. confidence and also gave them first place in the group, earning a bye to the quarterfinals. Probably the second most famous goal in the Miracle on Ice, Mark Johnson’s first-period tally was just about as important as Mike Eruzione’s eventual game winner (Spoiler Alert: Eruzione’s goal is coming up on this list). With the Americans trailing 2-1 and only five seconds remaining on the clock, defenseman Dave Christian unleashed a long slap shot toward the Russian net. It was easily kicked away by Vladislav Tretiak. The only player who didn’t quit on the play was Johnson. The speedy forward darted into the Soviet zone, collected the loose puck and calmly tucked it past the bewildered Tretiak to tie the game with less than one second remaining. If he doesn’t score in that situation, who knows how the rest of the game would have played out. Johnson scored again in the third period (also on the video below with all goals from the game), with the U.S. trailing 3-2, to tie things up again, setting the stage for Eruzione’s eventual game-winner. The first-period goal represents one of the great hustle, heads-up plays you’ll ever see and it so happened to come in the biggest hockey victory in American history. Skip ahead to the 40 second mark to see Johnson’s first-period goal. The U.S. Olympic team had beaten Canada and the Soviet Union in back-to-back games, but needed a win over Czechoslovakia to win the gold medal in 1960. The U.S. and Czechs dropped the puck at 8 a.m. in Squaw Valley the day after Team USA’s stunning upset of the USSR. Team USA trailed 4-3 heading into the third period. Roger Christian tied the game early in the third and a pair of goals by Bob Cleary made it 6-4. Another goal came off the stick of Christian. One of the most dazzling of the bunch, however came when Bill Cleary went coast-to-coast, splitting the defense and scoring an utterly brilliant goal to make it 8-4. Modern day players would love to try to copy this move. There was no doubt after that. The U.S. added one more for good measure to ride a six-goal third period and win 9-4 to claim the first Olympic gold medal in U.S. hockey history. Clip from Forgotten Miracle, the spectacular documentary about the 1960 U.S. Olympic Hockey Team. I can’t recommend it highly enough. Buy it here. In the opening game of the 1980 Olympics in Lake Placid, the U.S. team found itself trailing Sweden with less than a minute to play. A loss in the first game would put the U.S. in real trouble for making the medal round. 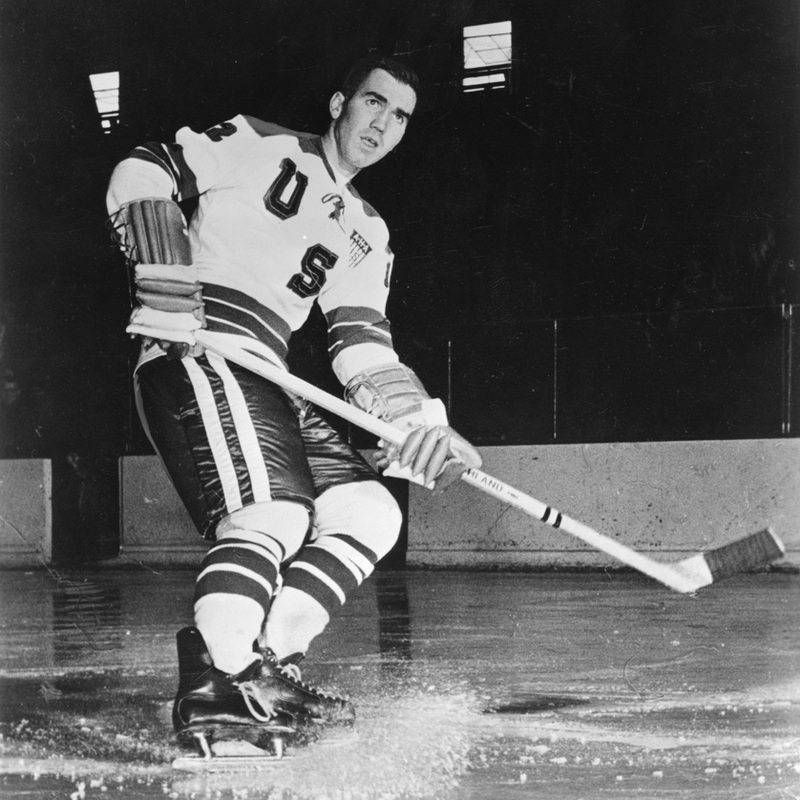 With goaltender Jim Craig pulled, the U.S. had a key faceoff in the Sweden zone. After winning the draw, the Americans worked the puck around the zone. As the puck came free on the far-side halfwall, Mark Pavelich found a seam to the wide-open Bill Baker on the right point. Baker one-timed a heavy shot that beat the goaltender through the legs with just 27 seconds remaining in regulation. The game remained tied and the U.S. picked up a crucial standings point. If Baker doesn’t score that goal, there’s a good chance the Miracle on Ice never happens. For whatever reason, heading into 2010, the U.S. couldn’t seem to get over the hump in the years following its first WJC gold in 2004, with only a bronze in 2007 in between. Canada, meanwhile, was riding a five-year gold streak. Having lost to Canada in a classic New Year’s Eve contest that ended in a shootout, the U.S. knew they could compete, but there had been so many close calls in the past. That prelim game made a lot of new WJC fans in the U.S. and all eyes were on Saskatoon for the rematch in the gold-medal game. The U.S. was two minutes away from winning the first gold in a roller coaster game, but a pair of goals from Jordan Eberle forced a stunning overtime period. Early in overtime, goalie Jack Campbell made a huge save on an Alex Pietrangelo one-timer. The rebound kicked right to U.S. defenseman John Ramage who hit John Carlson in transition. Carlson skated down the ice with Derek Stepan 2-on-1. He opened up his body and sold the pass, then without even looking at the net threw a perfect shot past Martin Jones for a dramatic overtime winner. The goal made an instant hockey hero out of Carlson and put the World Juniors on the map in the United States. It now has a U.S. television home for the foreseeable future thanks in large part to the buzz this goal generated. Now Carlson is a U.S. Olympian. In what may have been the greatest gift from Canada to the United States since John Candy, an errant clearning attempt by Canada’s Marc-Andre Fleury bounced off defenseman Braydon Coburn and into the net. Team USA’s Patrick O’Sullivan who forced the odd clear was credited with the goal. It stood as the game winner giving the U.S. its first ever gold medal at the World Junior Championship. You gotta love O’Sullivan’s drop-to-one-knee celebration for a goal he only had a cursory role in. This U.S. team featured future Olympians Ryan Suter, Ryan Kesler and Zach Parise and this group had a big role in paving the way for more international success. In the decade since this tournament, the U.S. has collected two more WJC golds and six World Under-18 Championships. Before then, U.S. teams were just happy to make the medal round. Now there is an expectation to win. 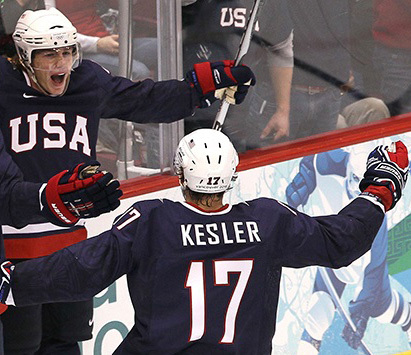 The 2010 Olympics was a bit of a perfect storm for hockey in the United States. The tournament was in Canada, meaning games would be held at times when people were actually awake enough to watch. Fan interest in the NHL was also noticeably on the rise. Add all that to the fact the U.S. had fresh-faced stars easy to sell to the country and you had a team that became both very exciting and very easy to root for. With Team USA’s 5-3 win over Canada in the preliminary round, a shocking victory on Canadian soil, the American television audience was fully bought in to this U.S. hockey team. An average American audience of more than 27 million viewers were tuning into the gold-medal game between host Canada and the United States. 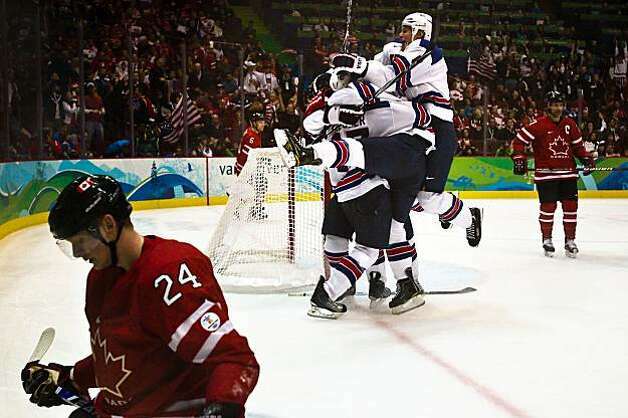 With Canada leading 2-1 late in the third period, the Americans were in desperation mode. With goaltender Ryan Miller pulled, the Americans worked the puck around the zone. Joe Pavelski found an open Patrick Kane who spun a shot towards the net. The puck nicked off Jamie Langenbrunner’s skate and off Luongo. Zach Parise was there to knock home the rebound with 24.4 seconds remaining on the clock. Nearly 35 million U.S. viewers were tuned in for the final minute of that game, making it the most watched hockey game since the 1980 Olympics in the USA. Had the Americans beaten the Soviets but lost the gold medal in Lake Placid, that moment would have been nice, but perhaps a little hollow without the title. The Americans had to come back in every game they played and it was no different in the final game against Finland. With the U.S. trailing 2-1 in the third period, Phil Verchota scored an early goal to knot the game. Minutes later, after a beautiful play behind the net by Mark Johnson to draw two defenders, Rob McClanahan was left alone in front. Johnson slid the puck to McClanahan who waited for the goalie to open up the five hole and he slid the puck through. The U.S. got one more for insurance and completed their improbable run as champions. Coming into the 1998 Olympics, the first Winter Games to include women’s hockey, the U.S. National Women’s team had lost all four previous IIHF World Championships to Canada. However, a rather stunning preliminary-round win over Canada in which the U.S. scored six goals in the latter half of the third period, the American women knew they had a chance. In the gold-medal game, the U.S. had a 2-0 lead heading into the third period. After Canada got on the board in the third, they kept clawing to try to get back into the game. It wasn’t until Whyte picked off a pass in the neutral zone and sent a long shot into the empty net that the game was clearly in hand. The U.S. could finally breathe a sigh of relief and only had a few seconds more to start the on-ice celebration of the first-ever women’s hockey gold. The 1996 World Cup of Hockey was somewhat of a testing ground for the NHL in the Olympics. The league had already decided it would go to Nagano in 1998, but would it work? The World Cup, played just before the 1996-97 NHL season. The U.S. team, made up of a bevy of stars in their prime years including Chris Chelios, Brian Leetch, Brett Hull, John LeClair, Mike Richter and Keith Tkachuk cruised through the tournament until the final round. The championship was to be decided by a three-game series between the U.S. in Canada. Team USA would play a game in Philadelphia, then two in Montreal. The Canadians took Game 1, the Americans came back and won Game 2. In the decisive Game 3, the U.S. and Canada were knotted up 2-2 with under three minutes to play. The U.S. had pretty much all of the momentum late in the game. As the clock ticked down, Tony Amonte whipped around the Canadian zone. He dished the puck to Derian Hatcher, who fired a hard shot towards Curtis Joseph. Amonte charged hard to the net. As the rebound popped free, Amonte slapped it ahead from a tight angle. It went up and over Joseph with just over 2:30 remaining in the period to make it 3-2. The play was actually reviewed to make sure Amonte didn’t kick it and after a long look, the goal counted. The U.S. added two insurance tallies to close out a 5-2 win and give the U.S. its first major championship since the 1980 Olympics. For many of the current generation of NHL players between 25 and 35, the World Cup was their Miracle on Ice. This wasn’t a miracle though. It was a watershed moment for USA Hockey delivered by the most talented collection of players the U.S. has ever produced. Canada’s best on America’s best was no longer a mismatch. Here’s full highlights from the decisive Game 3. Amonte’s goal comes shortly after the 11:10 mark on the video. In 1960, teams were split into three groups and played two round-robin games. The top two teams from each group advanced to the medal round. Each team in the medal round played each other once with the best record at the end getting the gold medal. The way the schedule worked out, the U.S. would have to play Sweden and Germany first, then they would have to play Canada, the Soviets, then Czechoslovakia, the three best teams in the world at that time, consecutively. The U.S. stunned Canada thanks to the terrific goaltending of Jack McCartan, but they still had to beat the favored USSR. In front of an overflow crowd at Blythe Arena in Squaw Valley, the U.S. and USSR were knotted 2-2 late in the game. The Americans held off a Soviet attack and headed up ice led by Roger and Billy Christian. In a net-front scramble, the puck popped out to Christian who buried it from close range. The goal gave the U.S. the lead and they held on to win. The next morning, they beat Czechoslovakia to claim the United States’ first-ever gold medal. Even though the Czechoslovakians were the last opponents, this game against the USSR was essentially the gold-medal game for the Americans. By beating Canada and the Soviets consecutively, the Americans had slayed the two biggest giants in hockey. Luckily, the 1960 Olympics were the first Olympic Games ever televised, so there’s great documentation of the USA’s first-ever gold medal. You’ve probably seen this 1,000 times and you probably aren’t tired of it. Mike Eruzione certainly wasn’t Team USA’s best player, but it’s rather perfect that the team’s emotional leader and captain scored the most important goal in USA Hockey history. The amazing thing about this goal is that the U.S. was able to hold off the Soviets for 10 minutes after it was scored. It was the storybook ending to one of the greatest sporting events of the century. That team helped grow the game throughout the country and inspired future generations of American hockey players. Will there be another goal to add to this list after the Sochi Games? We’ll find out soon. Editor of The United States of Hockey. Contributor to CBSSports.com, USA Hockey Magazine and more. Former USA Hockey PR guy. Current Iowan. This entry was posted in 2014 Olympics, NHL, U.S. National Teams, USA Hockey. Bookmark the permalink.